Also see: What’s next for the AppleTV? The AppleTV, obviously, is a different beast from the iPhone. But they do share one thing in common besides the Apple name: No sooner had the products hit the shelves at an Apple Store or were available online, hackers, developers, and sadist techies immediately started ripping them apart. In the case of the AppleTV, hackers instantly looked under the hood to examine what version of OS X was running. They complained the 40 gig hard drive was too small, so they discovered how to upgrade to larger drives — voiding the warranty, of course. Since the AppleTV only plays content from the iTunes Music Store or what you prepare in the H.264 or MPEG-4 formats, hackers found ways to play DivX and other standards. Just like I did for the iPhone, I’ve collected a variety of resources dedicated to the AppleTV, presented here with an added bit of commentary, where appropriate. As always, lists are never complete or perfect, so feel free to jump in and add your own favorites to the comment section. Everybody did a great job expanding the iPhone resources list. Because I still hear people asking about what the AppleTV does, a good place to start is with the reviewers and product testers. Here’s two of the big guns: The New York Times’ David Pogue and the Wall Street Journal’s Walt Mossberg. Macworld dedicated the June 2007 issue to the AppleTV and is an excellent resource with a review, a 10-page hands-on guide, and a note how to select the right HDTV. (Additional Macworld coverage.) Other reviews of note are from Engadget, Ars Technica, and Anandtech. Last100’s look at the AppleTV, months after its release, is here. You will find all the major Mac publications and blogs covering AppleTV in some form or fashion. Here are a few indie sites dedicated to the device: Apple TV Wiki, where you can find favorite YouTube videos, AppleTV annoyances, how-to articles, reviews, and a lot more; and AppleTV Source, a nicely put-together site covering not only AppleTV but similar products and the overall market. Active-TV Technology provides news about networked set-top boxes, extended-PC and TV-Web channel development, not just news on AppleTV. The AwkwardTV Wiki is a thorough source for news about the AppleTV and the set-top box, media center, home entertainment industry. 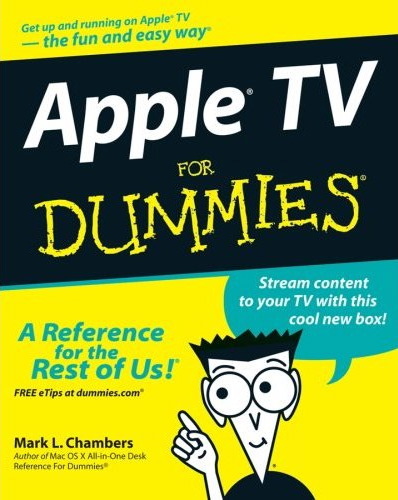 While on the subject of information, there are three books dedicated to the AppleTV: The Apple Training Series: Apple TV Quick-Reference Guide, The AppleTV Pocket Guide, and Apple TV For Dummies. (There’s a Dummies book for everything, isn’t there?) These books range from light reading (Pocket Guide) to more in depth (Dummies) and all, of course, provide more information than Apple’s paltry documentation. Despite the lack of quality physical documentation for the AppleTV, Apple does provide an overview, tour, tech specs, and hints on connecting your TV, and sync’ing and streaming content on its web site. If you want bare bones information, stop by Wikipedia, which provides a tremendous reference list for additional reading. I found no specific podcast or video podcast dedicated to the AppleTV. If you know of any, please let me know. The AppleTV has been covered by many of the top podcasts and video podcasts, including This Week in Tech (TWiT), the MacCast, and Geek Brief.tv, among many more. You can go to these sites and query the archives to find shows dedicated to the AppleTV. There are two good sources listing HD video podcasts, however. One is from AppleTV and HD Video Podcasts, listing shows dedicated to tech, sport and recreation (all golf), health and lifestyle, film and TV, comedy, food, places and travel, nature, news and politics, music, science, automotive, culture and arts, and gay and lesbian. But a word of caution: The list doesn’t seem to be updated very often. The other source is from AppleTV Source, which looks to be updated more frequently but doesn’t have a convenient categorized index. Within days of its release, users were seeking ways to hack and modify the AppleTV. They worked out upgrading the hard drive, adding AC-3 (Dolby Digital) 5.1 channel support, and ways to play other codecs, AppleTVHacks offered a $1,000 US reward for an external USB drive hack to utilize the not-in-use-yet USB “service port”. Particular attention was paid to the AppleTV’s operating system, which Mossberg noted was a “modified version of the Mac operating system.” Through hacks users can access the device remotely through SSH; regular versions of OS X and Linux have been installed on the device; and they’ve found ways to get Back Row running on other Apple Computers. And now for disclosure: I’ve tried none of these. But for those of you who are not faint of heart, here’s a few more resources. AppleTV Hacks lists hardware and software hacks with a How To section. Squidoo includes a list of AppleTV hacks and video conversion software (more on this in a minute). There’s also AppleTV Hacker. Ilounge, another great source for all things iPod, AppleTV, iPhone and Apple, has prepared a guide to AppleTV 1.1 software — the only update to date — which now includes YouTube functionality. Joost reports that tutorialninjas.net got Joost to successfully run on the AppleTV. The Ninja AppleTV hacks are here. A small discussion of AppleTV hacks can be found at the AppleTV BBS. ZDNet Updates include AppleTV hacks and news. Engadget provides how-to articles on playing DivX and Xvid on the AppleTV and upgrading the hard drive. If you want to use a Harmony Remote with your AppleTV, this might come in handy from MacRumors: Forums. If you want to use an external USB hard drive for additional storage, Gizmodo tells you how. It’s also posted a Top 5 list of AppleTV Hacks. This is perhaps the top complaint of the AppleTV: It plays only H.264 and MPEG-4 formats, the same as the iPod with video and the iPhone. The rest of the Web uses all sorts of codecs — DivX, Xvid, WMV, and many more. If you want to watch content other than what you buy at the iTMS, you’ll need to know how to convert video. I’ve dabbled in video conversation quite a bit and found it immensely frustrating and time consuming. There are a slew of third-party vendors offering solutions, but which ones are the best? And for those of us who are not videophiles, what do all these settings mean and what combination produces the best result? Your satisfaction with these solutions will depend upon your tolerance for quality. The better the quality, the longer it takes to rip and re-encode. The files are larger, too, but that isn’t as much of a problem if you have ample hard drive space; transfer time to the AppleTV is slower, too, but that’s negligible. The lesser the quality, naturally, the faster the process. The gents at iLounge have put together one of the best tutorials for video conversion I’ve seen. They cover the Mac, the PC, and discuss video formats for the AppleTV, iPod, and iPhone. Macworld provides a tutorial as well. Trust me: Do not venture into the jungle without a map. I did, and now I am lost. I tried using Mac solutions, but they seemed ridiculously slow (although I am using only a Powerbook G4). I found a solution on the PC (Xilisoft) that allows me to rip (extract the video from a DVD, even copy protected) and re-encode it in the same process, which is faster and requires less oversight than the two-step processes. I’ve converted a bunch of TV shows and movies (which I or a family member own) in a variety of qualities, all of which are fine for me. One other note. If you have a second computer and it’s fast enough, use it to rip and encode. That way the process won’t slow you down on your primary computer and you will not introduce glitches and spikes in the video because resources are depleted. Daniel, thanks for the mention of AppleTVSource and AppleTVHacks.net. I blog for both the sites and I feel honored for the sites to be included on the list. With the iPhone getting all the attention nowadays, it feels like the Apple TV is the forgotten child of the iProducts. By the way, you mentioned that the HD podcast compilation on AppleTVSource does not have a categorized index. I am working on redoing the list to make it easy to search. Look for the new and improved version next week. No problem Luck! Keep up the blogging. I have no idea what “mac solutions” you tried that were so slow, but ripping DVDs and converting movies is far easier on a Mac than it is on a PC. It’s not that difficult of a process, perhaps you should look a little more closely next time. I hacked my aTV if you can call it hacking. The device runs OSX just stripped down, so you can copy most files from your mac to the aTV to add features. Right now my aTV has a file broswer, which mac and pcs in my house can drop vids into. It supports any vid format, except maybe real media, never tried that. The aTV also runs os X apps including Joost. I also have a web browser, and I enabled USB so that if a friend throws a video on a flash drive it can be plugged into the USB port and then played on the aTV. All in all a pretty damn sweet device. Too bad Apple didnt make it do all this from the get go, and it required about 12 hours of moving files around, adding some code, and a hell-of-a-lot of testing. But it works. You forgot to include iClarified! Oh well I have to agree with 40 gig being way to small for running something like that. As for hackers, I hate them always stealing programs and then dishing them back out with all kinds of viruses. It is stupid and costing the economy a lot! Also I just wanted to say that this is a very well thought out post and I am just loving it. I have been contemplating getting into the whole Apple TV thing but I have yet to do so. Again, nice post, keep ’em coming!